Fly to Adelaide and begin your Murray River adventure.You will be personally met at the airport by a DISCOVER AUSTRALIA representative and transferred from the airport to your hotel. Transfer to Murray Bridge, Dinner, Overnight Accommodation Onboard the Proud Mary. Enjoy a hearty buffet breakfast as you cruise through Mypolonga, Wall flat, Caloote and Ponde towards Mannum. Disembark at Mannum and enjoy a guided coach tour of this historical township. Learn about the significant role Mannum played in the development of South Australia and where Captain William Randell launched the first paddle-steamer the “Mary Ann” in 1853. Your guided tour also includes entry to the “Olden Days, Olden Ways” museum where you will also see fascinating historical memorabilia of this township. Depart Mannum and cruise upstream through Younghusband, Teal Flat, Lake Claret, Bowhill, Purnong and onto Walker Flat while you enjoy a sumptuous lunch prepared by your onboard chefs with dishes such as Chicken Saltimbocca with Asparagus or Pork Cutlet with Yam Mash. Moor at Walker Flat, your home for the night and enjoy taking in the prolific wildlife and birdlife of the area. This evening is “Australiana Night”. Enjoy a dinner that showcases Australia’s ever evolving cuisine and featuring traditional bush food such as emu, kangaroo, damper bread and fresh water crustaceans with flavours of lemon myrtle wild bush tomatoes and quandongs. This evening join your onboard expert ecologist for a Nocturnal Discovery Tour. Learn about the abundant local wildlife including the rare Southern Hairy Nosed Wombat. This rare species is only found in a limited area on the western side of the river but hopefully you will see a few active in the wild on your coach tour to their warrens. Return to the Proud Mary for the night after your tour. Breakfast, Mannum Coach Tour, Lunch, Special Dinner, Nocturnal Discovery tour, Overnight Accommodation Onboard the Proud Mary. Depart Walker Flat this morning and cruise upstream past Wongulla, where the fossil of a 20 million year old shark was found 50 years ago. Enjoy a hearty breakfast while you cruise past the towering ochre cliffs of Big Bend. You may also wish to browse through or purchase some of the souvenirs on display in the Dining Room. Morning tea is also available in the Dining Room before you join the Captain for an informative talk on the Murray River including its history and the ecology of this diverse area. Arrive at the township of Swan Reach, first settled in 1899 and enjoy a guided tour of Murray Aquaculture, one of the most ambitious aquaculture projects undertaken in Australia. Learn about the yabbie, one of Australia’s endemic species whilst you are taken through the complex covering 10,000 square metres of ponds, nurseries and an interpretive information centre. Your eco-guide will provide you with an insight into fresh water crustacean biology, production and marketing. After your tour, visit one of the largest almond plantations in the world, with over 15,000 almond trees that supply export grade almonds. You may even be able to sample some of the produce! Rejoin the Proud Mary and enjoy another delicious lunch as you cruise to Blanchetown, site of Lock and Weir 1. The Murray River has 13 locks which control the water flow and level of the river. The locks create an excellent feeding place for the local birdlife. Watch pelicans and dozens of other species of water birds diving into the water to feed. This evening, enjoy a roast dinner as you cruise to your overnight mooring at Portee Landing. Cruise close to the bank under floodlight and look for possums and other wildlife as they scamper through the branches of the river redgums. Breakfast, Murray River Information Session, Murray Aquaculture Tour, Almond Plantation Tour, Lunch, Dinner, Overnight Accommodation Onboard the Proud Mary. Take in one of the most picturesque and unspoiled areas of the Murray River this morning as you enjoy a choice of either a full English breakfast or a continental breakfast. Enjoy another unique experience this morning as you take an ecological walk around Portee Station. Learn about the importance of the floodplains to the river system and see some of the last remaining evidence of an ancient Aboriginal civilization. Learn about Moorundie Creek, named after the Aboriginal tribe that lived in the area and where explorer Edward John Eyre established the village of Sturt in 1840. Depart Portee Station and cruise to Swan Reach for a brief stop while you enjoy the informative onboard commentary as you pass magnificent lagoons and stunning cliffs. At Swan Reach, you may choose to disembark for a short stroll around the town and visit the Swan Reach Hotel, built around the original Swan Reach Station Homestead or you may choose to stay onboard the Proud Mary. Thos afternoon, enjoy lunch as you cruise to Big Bend, where you will moor for the night alongside the tallest cliffs along the Murray River. Enjoy a small boat cruise with your onboard ecologist through the lagoons and inlets of the river. Enjoy getting up close to the cliffs and on your flat bottomed boat and learn about the diverse wildlife and birdlife of the area such as kangaroos, wombats, goannas, echidnas and emus. This evening enjoy a traditional Aussie barbeque under a canopy of stars. Later, join n the evening’s entertainment around a campfire with your resident musician. Request a song and you can even sing along if you choose! Breakfast, Portee Station Tour, Self-Guided Swan Reach Tour, Small Boat Ecology Cruise, Barbeque Dinner, Evening Entertainment, Overnight Accommodation Onboard the Proud Mary. Enjoy an early departure this morning from big Bend and enjoy breakfast as you cruise towards the Ngaut Ngaut Aboriginal Conservation Site. Enjoy a guided tour of one the oldest archaeological digs in Australia and walk along the boardwalk to the site of ancient Aboriginal rock art where your local Indigenous guide will explain their meaning and significance. See the ceremonial site dating back thousands of years where Aboriginal tribes met and prepared food. You can also take in magnificent vistas from the top of the cliffs. Depart Ngaut Ngaut and join your fellow travelers in the Dining Room for an informative documentary on the Murray River as you cruise through Krohns Landing, Sabaruma and Walker Flat. Enjoy lunch as you continue cruising south to Mannum. Enjoy some free time in Mannum or get ready for your special Captain’s Dinner tonight. Tonight, enjoy the culinary highlight of your cruise, a five-course silver service dinner featuring mouth watering dishes based on modern Australian cuisine. Enjoy the food, wine and atmosphere and enjoy a chat with the Captain as he visits every table. Dress up and enjoy the gorgeous formal dinner. Breakfast, Guided Tour of Ngaut Nguat Conservation Site, Murray River Documentary, Lunch, Special Captain’s Dinner. Depart Mannum this morning and cruise to Woodlane via Ponde, Caloote and Wall Flat. Board the waiting coach at Woodlane for your guided tour of Reedy Creek Environmental park. The Park was an important gathering point for local Aboriginal tribes as it provided a continuous source of water throughout the year. Return to the Proud Mary and enjoy a smorgasbord lunch as you cruise back to Murray Bridge. Arrive at Murray Bridge and say goodbye to your fellow travelers. You will be transferred to your Adelaide hotel for the night. Breakfast, Guided Tour of Reedy Creek Environmental Park, Lunch, Transfer to Adelaide, Overnight Adelaide Accommodation. Today marks the end of your indulgent Murray River adventure. You will be personally met at your hotel by a DISCOVER AUSTRALIA representative and transferred from your hotel to the airport for your flight home. 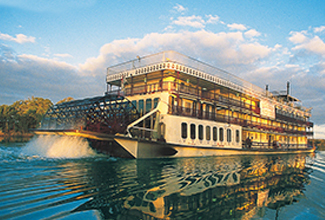 The Proud Mary 6 Day Murray River Indulgence Cruise with Adelaide Stay is very popular. Many dates book out well in advance, please book soon.